Jenny brings her dynamic Soul from Santa Cruz. Jenny studied dance and kinesiology and also received her pilates certification. Jenny’s passion for helping people through fitness translates through her work as a co-founder of a 501(c)3 organization focused on promoting fitness as a platform for women to build confidence. Since 2011, Jenny has created and managed large-scale charity fitness events and after-school programs to provide women with tools and resources necessary to achieve and sustain a positive body image. Rachael's free-spirited SOUL originated in Portland, Oregon. 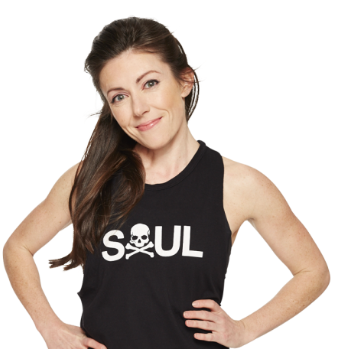 Sidelined from her professional dance career in NYC due to a foot injury, Rachael found that SoulCycle played an integral part in her road to recovery, both mentally and physically. Her classes focus on her approach to healthy movement as a sweaty practice of perseverance, strength, celebration, and gratitude. Rachael’s quirky positivity, natural athleticism, and dancer intuition combine together to create a challenging and always exciting ride. Paula grew up in Seattle Washington and easily adapted to a similar yet warmer Bay Area lifestyle when she moved south for college. While attending Stanford University she danced with the marching band as a Stanford Dollie at all major sporting events! As a former dancer, her class incorporates choreography while maintaining control and body awareness with proper resistance. She emphasizes form and truly connecting with each and every amazing beat she delivers. Paula creates a journey that enables her riders to conquer their days with more confidence, strength and style! Originally from Pittsburgh, PA, Heather brings her eclectic musical SOUL via Nashville, TN and New York City. After graduating from Belmont University in Nashville, Heather spent years singing and performing all over Tennessee and eventually New York before landing in California. Her love of all music genres is apparent in her classes with playlists including Pop, Rock, Soul, Electronic and Hip Hop. It's a full on mind, body, cardio party! MK is a California girl born and raised. After graduating from Stanford University, she spent the next 3 years working in finance. She quickly realized, however, that snapbacks would never be considered appropriate business casual attire, so she decided it was time to start pursuing some of her more creative passions. MK fell in love with SoulCycle because it combined all of her favorite things: music, exercise and community. In her class, you’ll tap it back and tap into your true self! Although Lindy's small in size and sweet in nature, don't be fooled... her killer workouts are fierce and focused! Lindy incorporates elements of her yoga and performance background into each class, focusing on breath control and body awareness. And while she loves to ride to Jay-Z, Diplo and hip-hop remixes, she likes to mix it up with artists like Ellie Goulding and The Lumineers. Ian brings his bold Soul from New York City. After working in the food and wine industry for 6 years, he made a New Year's resolution to live a healthier lifestyle and had no idea how far it would take him. One class at SoulCycle and Ian was hooked and knew that he was exactly where he needed to be. His class is fueled by the energy from the music and support from the pack around you. Off of the bike, Ian is a holistic nutritionist with a love of culture, tattoos, and the movie Titanic. Olivia brings us her motivational Soul from Nashville. Her career began as a professional opera singer. While performing on the road, her weight rose to more than 265lbs. and she was invited to compete on NBC’s The Biggest Loser. Olivia successfully lost 50% of her body weight — and was crowned winner of the show’s Season 11. After the show, Olivia moved to NYC and found her passion: SoulCycle. After only a few rides, she knew Soul would be the key to her new healthy lifestyle and a way she could pay it forward to others.